May you live life like a Lotus, rising above and float above the muddy waters. These Lotus flower inspired 18k gold rings are dipped in your choice of yellow, white, or rose gold with diamond details all over, adding a beautiful sparkle. 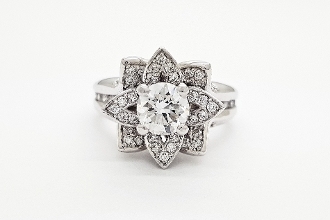 Each ring was designed in three separate pieces to insure that the ring showcases the luxurious craftsmanship and intricate details of a lotus. This ring promotes tranquility and reminds you to stay grounded while adding a bit of bling to your life!